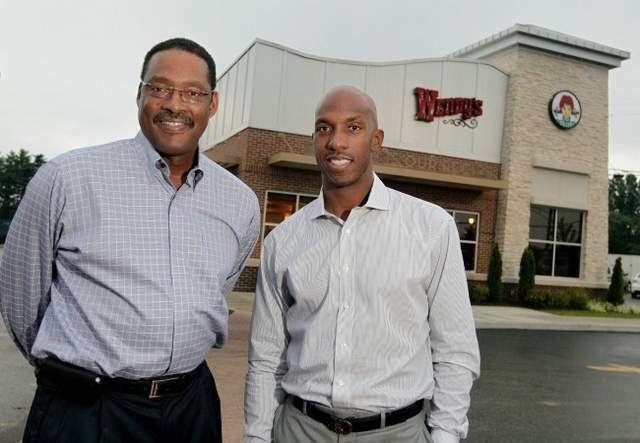 Former U of L hoops star and NBA veteran-turned restaurant mogul, Junior Bridgeman, is partnering with NBA star Chauncey Billups to buy 30 Wendy’s hamburger franchise stores in St. Louis. Bridgeman, who, after 12 years as a sixth man for the Milwaukee Bucks and president of the Players Association, returned to Louisville and made his home here. With his hoops days behind him, he became: one of the burger chain’s largest franchisees; a franchisee of more than 100 Chili’s restaurants; a Fazoli’s franchisee; owner of Mark’s Feed Store; and he recently purchased Napa River Grill, which he wants to expand. Bridgeman invested in some Chicago-area Wendy’s shortly before his NBA career ended in 1987. As he grew his franchise holdings, he was known to work the grill in one of his restaurants almost daily for years. Not because he was shorthanded, but because he wanted to stay in touch with his business. No surprise that, according to Forbes magazine, Bridgeman is ranked as the 18th wealthiest African-American business person, whose net worth is estimated somewhere north of $200 million. Here’s to hoping Billups has recognized the valuable mentorship he’s about to get from a basketball legend who became infinitely more successful in restaurants. For trivia’s sake: In case you don’t recall Bridgeman’s playing days at U of L, he was a starter on the school’s 1975 Final Four team that lost a heartbreaker in the final seconds to UCLA. Had U of L won, they would have played U of K in the finals two days later. UCLA won the final game, which was then-coach John Wooden’s tenth–yes, tenth–NCAA men’s hoops trophy. For further trivia, Wooden announced that night it would be his last game at the school, and immediately the school began courting U of L coach Denny, who played for and coached with Wooden. Thankfully, Crum stayed, eager to continue building what he knew would become a college hoops powerhouse. Five years later he one the first of his two NCAA championships.